In the last 10 years the number of people stock trading has grown exponentially. Indeed, the benefit of including stocks in your investment portfolio means entering and trading in one of the biggest global growth industries – with the potential of lots of profits. However, if you are not actually working for one of the world’s leading stock brokers, how do you go about starting? Probably the biggest single reason why there has been such an explosive growth in the buying and selling of stocks over the past 10 years, can be put down to the Internet and online stock trading. By utilizing the Internet, the world of stocks is no longer exclusively that of stock brokers but is open to all. Step 1 - purchase a home computer. You can do this by either purchasing a standalone desk-top computer or by purchasing a lap-top computer. What you will need to do though is make sure the computer you purchase has the capabilities to use the Internet – preferably broadband – and also has enough memory to run the latest stock market software package that you are going to need. Step 2 - access to the Internet. Once you have purchased your home computer, the next step you need to take is to have access to the Internet. Ideally you would want to make sure that you have broadband Internet access. Having said this, the most important aspect with respect to the Internet access you have is the reliability of the Internet service provider. Step 3 - open an account with a stock broker. Once you have completed steps 1 & 2, step 3 entails you having to open a trading account with one of the online stock brokers. 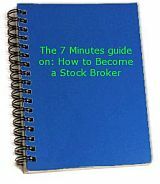 Before you rush in an open an account with the first stock broker you see advertised on the Internet, make sure you take the time to review the broker’s terms and conditions of stock trading to ensure that you are getting the best possible deal. (1) which stock markets does the broker have access to? Not all stock brokers have access to all markets. For example, a broker may have access to the NYSE, but not to NASDAQ – so do check this. (2) is the broker an agent? Some brokers are too small to stock trade by themselves and need to go through larger brokerage houses. Although not necessarily a bad thing, two problems that exist here are time and money. After you have been stock trading for a while you’ll know time is money and if the broker needs to go through an intermediatory, this will take longer, which could end up costing you money. Secondly, chances are that if the stock broker is going through an intermediatory to buy and sell your stock, they are likely going to be paying a fee for such a service. If that is the case, indirectly you’ll likely be paying this fee. As such, it is normally better to go with a larger broker, where this issue should not be a problem – but check it anyhow! (3) commissions: Commissions are not the same with all brokers and a careful balance needs to be drawn between cheaper commissions, which are usually consistent with less of a service, and better stock brokers service, which are usually consistent with higher commission fees! Once you have completed steps 1, 2 and 3, you should then be ready to start your stock trading career – so best of luck!